In 2013, Zion Packaging moved its facility to Corona, CA. The main reason being that we needed more space. 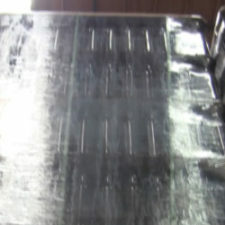 Why you say, well we just purchased 2 glass & plastic screen printing machines. These screen printing machines are state of the art, servo driven behemoths. By reaching out and networking we were able to partner up with Square Peg Packaging in San Diego, CA. Square Peg handles packaging for like 99% of the breweries in Souther California. Since partnering with SquarePeg, we have continued to branch out. We now have partners in the pharma, nutritional, beverage, and personal care markets. We look forward to doing any decorating that we can for you! Glow in the dark, fluorescent and thermo chromatic inks can add a special flair. 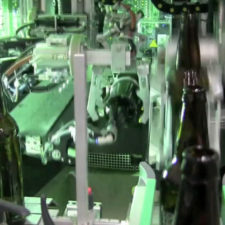 The bottle printing is like a CNC and can move according to the shape of the bottle. All our inks are organic no PROP 65 warning is needed. We can change the appearance of the container to be glossy or dull. We can change the texture of the bottle. Decorating containers confer a high quality, top shelf product. We can use metallic and pearlescent inks as well as precious metals. Bottles can be prepared as bulk, case packed or however works for you. First things first, we discuss the bottle that you are going to be decorating and your expectations for the finished product. 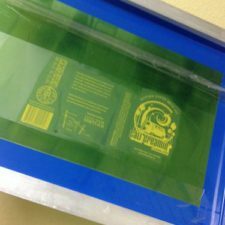 We then prepare a printing template based on the printable area of your container. Using this template, your design group prepares your artwork in accordance with the printing template and then submits it to Zion Packaging for conversion. Zion performs prepress and applies any need trapping, etc. to the artwork. We then provide you with a high-quality final proof for approval. It is then up to you to either return any changes to our design department for implementation or you authorize production and send a PO. After you have approved the artwork, we release the artwork to be printed as film positives. We use high quality image setters in order to produce the positives. Once the positives are produced, we can begin producing screens and getting the colors ready. We will adjust screen tension based on the bottle and depending on the artwork also. We have a large library of colors already available but our ink room can color match any sample provided. After the everything is prepared, the presses get fired up and running. For a standard 12oz bottle our screen printing presses can print up to 3000 pieces per hour. Throughout printing a random sample is taken of quality checking. 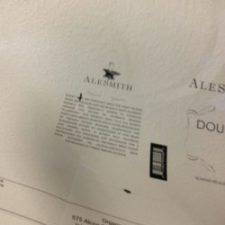 The final product is checked against the proof for color and artwork accuracy and a scratch and tape test is also performed. Once everything gets printed, your containers will get palletized and stored until they are picked up. Early in the discovery process, Zion Packaging will provide each customer with a die line (template) specifically suited to the container. This die line will define areas of the container in order to aid the customer in design. Zion die lines will be supplied in .pdf format. Our pre-press department runs on Macintosh. 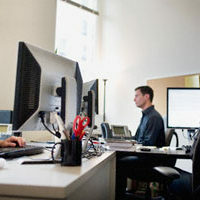 Artwork should be supplied in its native format (Illustrator, Photoshop), along with all supporting graphics and fonts. For best results, artwork should be applied in spot colors only. Please provide files uncompressed. Color separation is essential to screen printing. Please provide raster files in layers to allow for necessary printing adjustments. Any modifications Zion makes are exclusively to allow for a better printing result. Images must be correctly sized and properly oriented to the container. Images should be printed at a minimum of 175 lines per inch. Often a client will offer a family of products that may employ similar features or elements. There are design considerations that may allow the use of common positives/screens in several products, offering significant savings. Up to 6 color passes. For screen printing, expect to pay $77 per pass for setup fees. If tooling is required for your project, expect to pay from $3000-8500. If we have tooling available for your bottle we can typically start turning items within 2 weeks. If tooling needs to be procured then it will take 6-8 for machining. We typically require your average order to be about 25000 pieces minimum. However, if tooling is available, we have flat rate fees for small runs. Yes but very temporary. Unfilled containers, even in bulk, tend to take up a lot of pallet space. We request all customers to ship their bare ware components no earlier than 2 weeks before printing and to have their finished goods shipped within 1 week of printing. FOB California with advanced deposit and down payment for positive and screen creation. Zion will extend payment terms to qualified customers.